The 2012 TopQuants Keynote event on 23 May 2012 was a great success. More than 130 quantitative professionals followed the exciting presentation by Antoon Pelsser as well as the lively panel discussion afterwards. 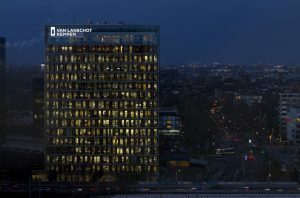 The event was hosted by ING bank at their Amsterdam headquarters. It commenced in the later afternoon with two short welcome notes, one by TopQuant Drona Kandhai, the second one by Harold Naus (Global Head of Corporate Market Risk at ING bank). In his keynote speech, Antoon Pelsser, professor of Finance and Actuarial Science at Maastricht University, talked about “Robustness, Model Ambiguity and Pricing”. While his current research interests are around insurance and the related risks, Antoon is actually more known by many quants working in the Netherlands for his work on interest rate modelling. Well aware of the interests of his audience, Antoon did not only address what he called “the two worlds”, namely “the insurance world” and the “banking world”, but also managed to sketch an integral view on these in his very instructive presentation. To illustrate the two worlds he loosely described the “banking world” as one which earns a living from trade margins but then strives to hedge away all risk. He contrasted this with the “insurance world” in which – partially unhedgeable – risks are deliberately taken in order to generate profits. Drawing on his ample professional experience in both the banking as well as the insurance industries, Antoon was able to spice up his talk with various real-life stories. Being a true quant, Antoon did of course not content himself with telling anecdotes about traders and actuaries. Instead, he took seriously the uncertainty we face even in pricing seemingly simple positions and developed valuation methodologies taking into account model ambiguity. To show his methodological framework at work, Antoon provided several illustrative examples, like the pricing of very long-dated cash flows and the pricing of unhedgeable Equity risk. Antoon’s keynote was received very well by the audience and the panel alike. The latter consisted, besides Antoon himself, of Philippos Papadopoulos (Head Economic Capital Modelling at RBS), Bruno de Cleen (Head Integrated Capital and Portfolio Management and Modelling at Rabobank), Theo Kocken (CEO Cardano Group and Prof. Risk Management at VU Amsterdam), and Fabrice Schelback (Global Head of Developed Markets Structuring and FO Quants at ING Bank). The panel agreed that Antoon’s research, while still in a nascent phase, highlighted several aspects of model ambiguity of enormous practical importance in the present situation of the financial industry and indeed of the economy as a whole. Several panel members mentioned in particular its relevance in the light of the current discussion of pensions in the Netherlands. To enliven the discussion, the TopQuants organizers had decided to confront the panel members with a number of – more or less controversial – statements. They were then asked to express their agreement (or disagreement) by raising a corresponding “Yes” or “No” sign. This lead to a lively discussion – gently but professionally hosted by TopQuant Martin van Buren – not only on the panel, but also involving several participants from the audience. As usual for a TopQuants event, all panel members and participants were offered complimentary drinks and snacks and could continue their discussions in an informal setting. TopQuants acknowledges the generous sponsoring for this event received from ING bank. Everyone registered for this event has received an electronic questionnaire. TopQuants will take the comments and feedback into account in the organization of future events. Watch the TopQuants webpage for more information about our activities in the remainder of 2012, to be released in due course!